July is approaching rapidly, so it's time to think carefully about how I'll survive it without using single-use plastic. I've actually been planning to do the Plastic-Free July challenge for nearly a year now, since reading Kate Griffin's excellent series of articles on the Sustainable Witney blog. Her writing not only prompted me to try the challenge myself; it also inspired me to blog about it in a Croydon-specific way while doing it. If I can build up a list of plastic-free options in Croydon, that'll be useful well beyond the month of the challenge itself. Doing this all on my own would be quite daunting, but luckily there's plenty of support and interest out there to help me along. Andrew Dickinson of Green Croydon has been very helpful and encouraging — check out his radio show on Croydon Radio tomorrow evening at 6pm for a section on Plastic-Free July. I'll be in the Shoutbox if you have any questions. Further afield, there are other bloggers taking the challenge, such as Westy Writes and Eco Thrifty Living. 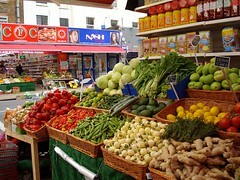 Unpackaged fruit and vegetables on display on London Road, November 2012. Croydon has an amazing variety of small independent shops, so I'm hopeful that some of their proprietors will be interested in helping me along with the challenge. So during Plastic-Free July I'm going to be talking to Croydon retailers about why I'm saying “no” to that carrier bag, why I'm bringing my own refillable container rather than taking yet another disposable one, and why I'm choosing to buy loose products rather than prepackaged. I did this for the first time yesterday, while buying bread at the Coughlans counter in North End Mall, and got a positive response from the staff member there — so I'm currently feeling very enthusiastic about the challenge!